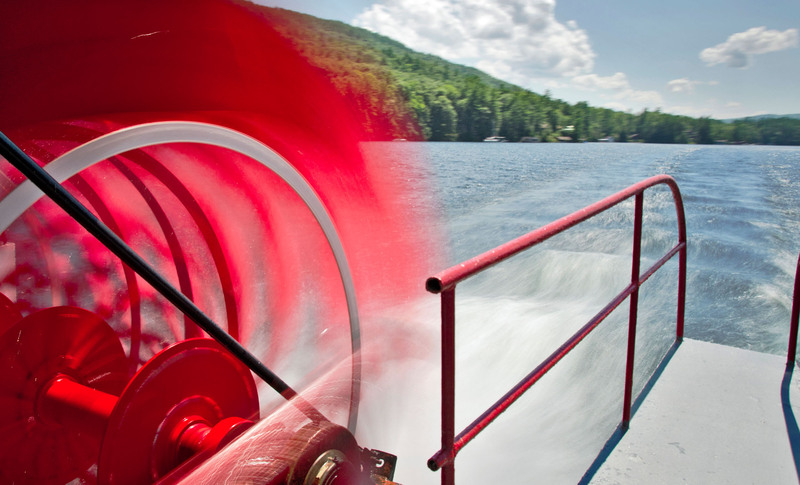 Cruises aboard our authentic Sternwheel Steamboat, Minne Ha Ha, take you on a tour of Lake George’s Southern Basin. Imagine the way people traveled our lake over 100 years ago! Step back in time, as the Calliope, powered by steam from the vessel’s boiler, serenades you while you board. Enjoy beautiful views of the Adirondack Mountains and see stately homes along the water’s edge. This one hour trip is fun for all ages! Gather your mates, cast off your land lubber ways, and join our Minne Ha Ha Captains and Crew for a one hour “Pirate Adventure Cruise”! Children receive a pirate loot goodie bag and are asked to join in a “treasure quest”. Liven up your evening, practice your “ARRRRs!” and be sure to treat yourself to a wee bit of Pirate Grog! Fun for all ages! 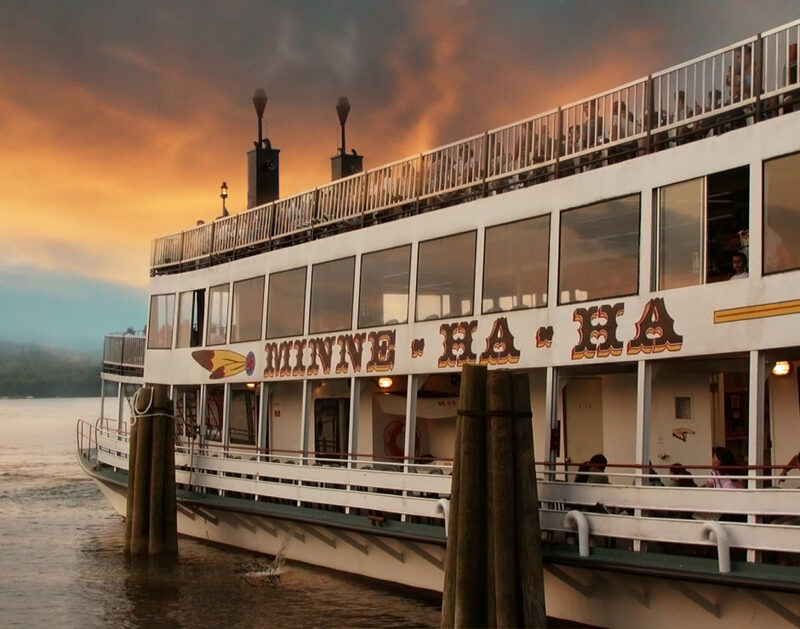 Minne Ha Ha means “Laughing Waters”. For an evening of pure fun and musical entertainment, join us for our newest Specialty Event: Minne “Rock the Dock!” Cruise and dance with some of the area’s hottest bands. Cocktails and snacks available onboard. Once docked, continue to enjoy the entertainment until midnight. The Paradise Bay Cruise is one of our more scenic excursions, offering views of lovely lakeside scenery and homes. Absorb the serenity of the Islands of the Narrows and the magnificent Adirondack Mountains. Conditions permitting, the Captain will skillfully maneuver through the channel and into Paradise Bay. Learn about Lake George’s points of interest, it’s history, geology and ecology. 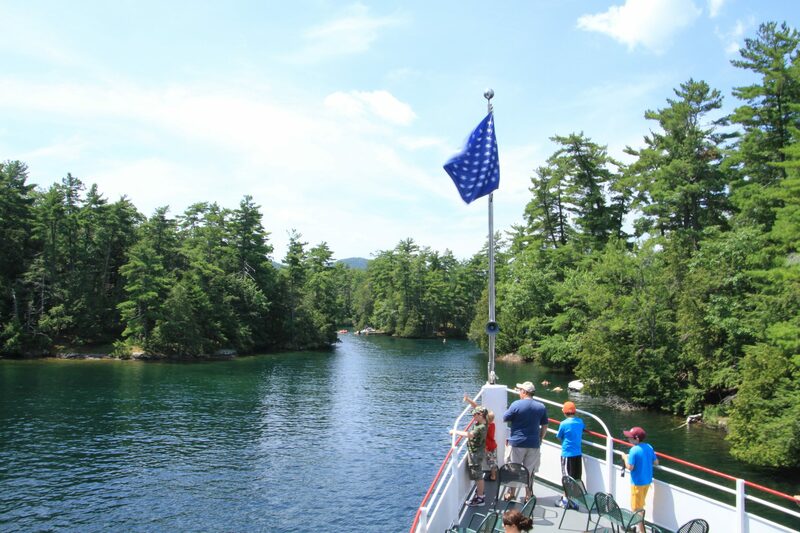 Primarily on the Mohican and occasionally aboard the Saint Sacrement (summer Tuesdays and in the Fall), the Islands of the Narrows Cruise takes you on a leisurely 14-mile afternoon trip through the many Islands of Lake George. The area called The Narrows, is easily the most scenic, peaceful, calming and beautiful spot on the entire lake. No roads line the water’s edge and it is easy to imagine life here hundreds of years ago. 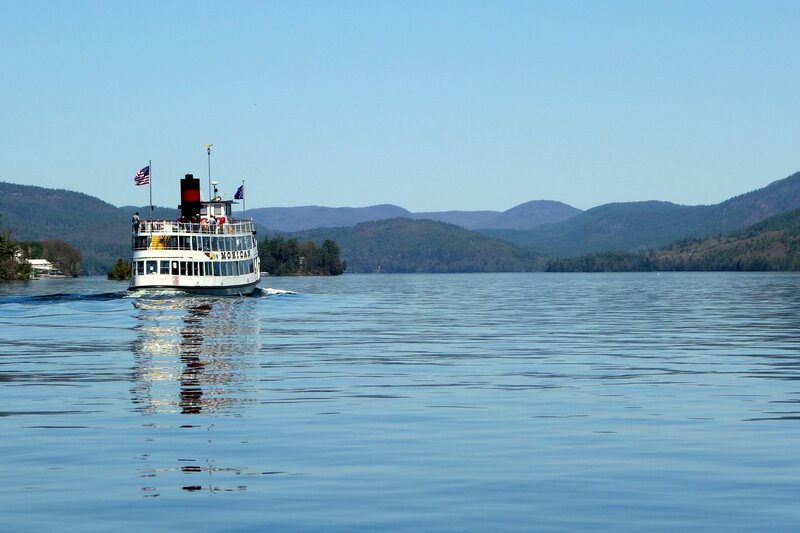 See for yourself why Lake George is called the “Queen of American Lakes”. 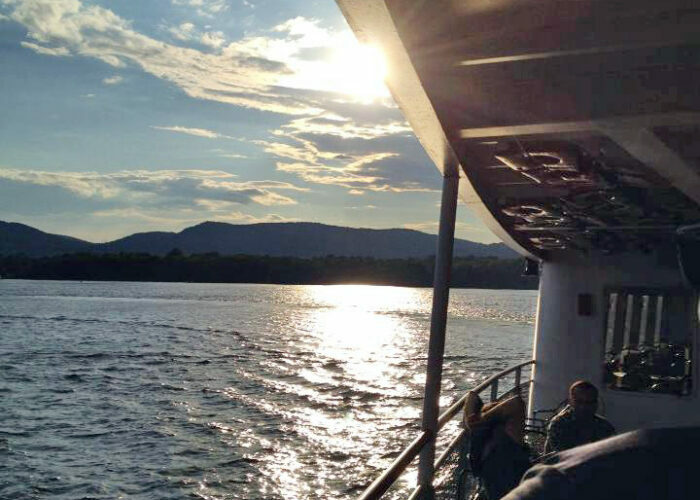 Learn about Lake George’s points of interest, it’s history, geology and ecology as you sail. 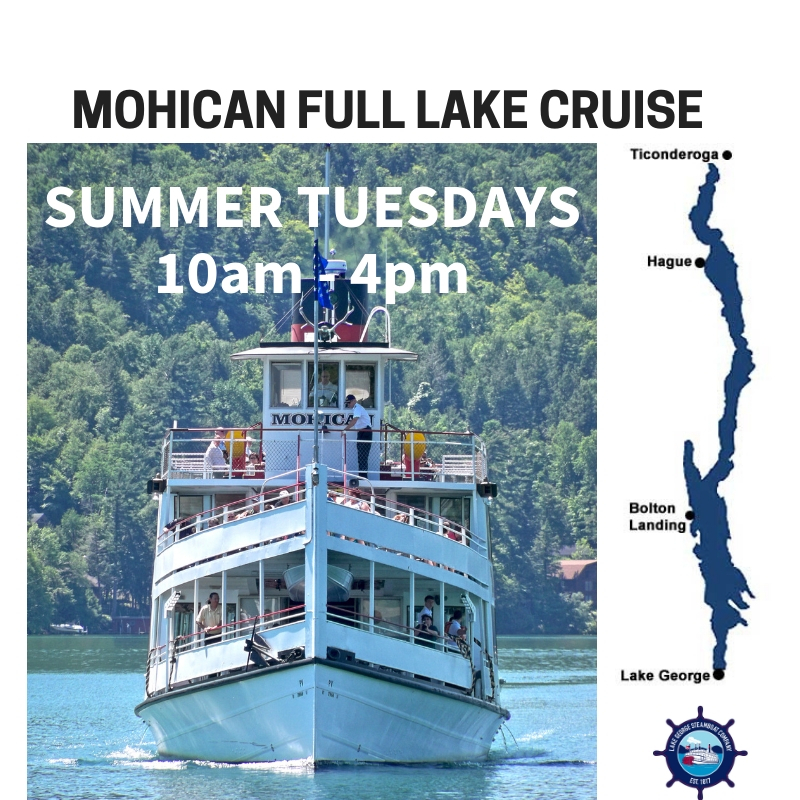 * On Summer Tuesdays, when the Mohican is out on her Full Lake Cruise and most days in the Fall, the Lac du Saint Sacrement takes Islands of the Narrows Cruise passengers on this beautiful trip. Enjoy a bird’s eye view of the Islands of the Narrows from the higher decks of the Saint Sacrement! Please use the Saint Islands Cruise tab (below) if you don’t see the date you want to book under the Mohican Islands tab. 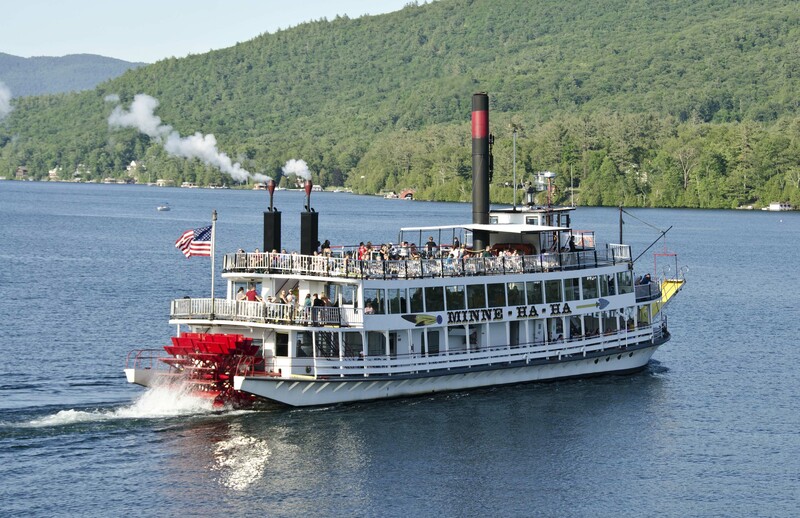 We offer the only complete tour of Lake George. 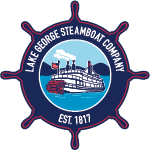 View the lake’s serene beauty from the decks of the oldest, continuously operated and inspected ship in the USA. 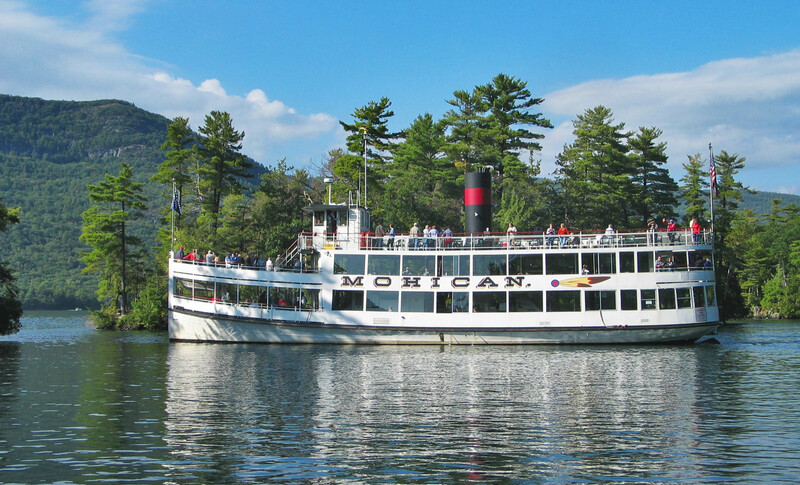 Built in 1908, the Mohican has been offering cruises on Lake George for over 100 years! Stunning mountain wilderness areas, islands, historic mansions and the beauty of the lake itself await. The Captain’s narration fully describes the history, geological formation of the basin and the lake’s present ecological balance. Our gift shop offers books of the Adirondack area, Steamboat Clothing and many other souvenirs. Lake George’s North is TRULY DIFFERENT from its South! On Sunday August 18th, 2019, we sail the annual Full Lake Bicycle Cruise. Purchase a One Way Ticket from Baldwin to Lake George: Park here at the Steamboat Company, drop your “after ride” gear at the boat and bike north to the Baldwin Dock outside of Ticonderoga. We will pick you up at 12:15pm and return you to the Steel Pier by 4pm. 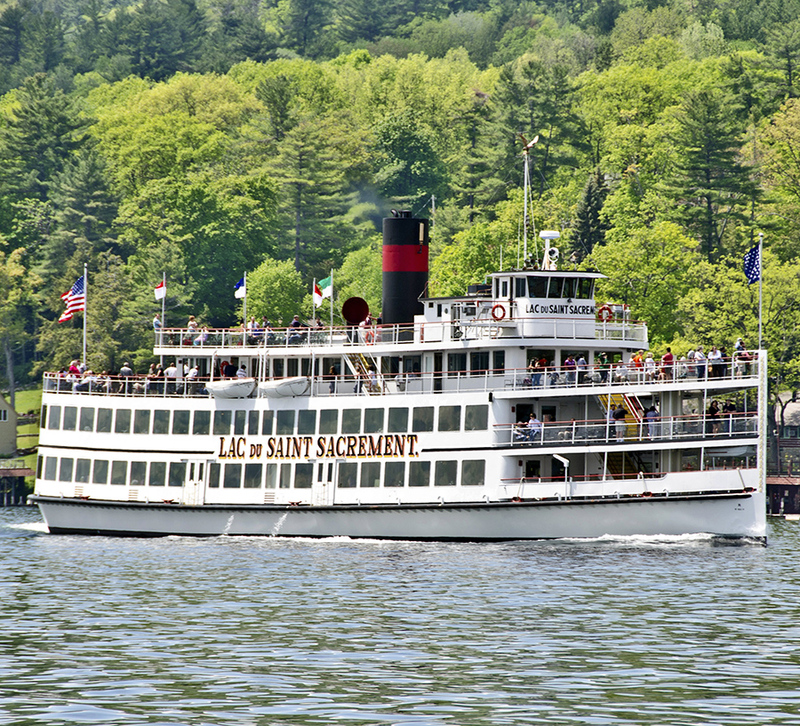 Purchase a One Way Ticket from Lake George to Baldwin: Park here at the Steamboat Company, cruise north to the Baldwin Dock outside of Ticonderoga and disembark for a bike ride south back to Lake George, where your car will be waiting for you. There is an additional charge for bike transport. Discover our Mohican Family Dinner Cruises. Fun for the whole family, the cruises sail Tuesday through Friday during the summer (June 18 – August 30). The perfect vacation meal and cruise combo! Build your own TACOS! Fill hard or soft shells with beef, chicken or vegetarian fillings and your choice of toppings! Soda and a churro for dessert included! Everyone’s favorite! Load up your MAC ‘N CHEESE with toppings like bacon, ham, broccoli and extra cheese. Salad, soda and dessert included! Who doesn’t love PIZZA! Each person gets 1/4 of a large PIZZA! Salad, soda and a brownie for dessert included! Penne Pasta with your choice of three different sauces: Marinara, Alfredo and Clam. Caesar Sald, Garlic Bread and Italian Ice for dessert. PASTA CRUISES are scheduled only occasionally, click the link below to see dates for Pasta Cruises. Prepared fresh daily, our buffet offers a beautiful salad bar, soup, 3 hot entrees: chicken, fish and vegetarian, a carving station, assorted breads and rolls, non alcoholic beverages and dessert. After dining, relax in your seat or head topside to enjoy the fresh air on the outer decks. 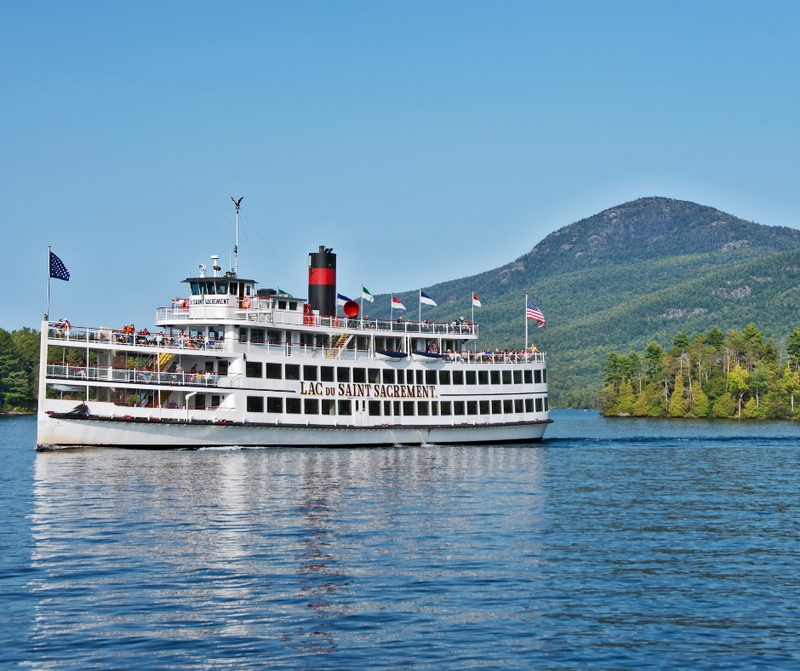 Cruise by beautiful mountain wilderness areas on the crystal clear waters of Lake George. The Saint’s dining room is climate controlled for your comfort. Not interested in lunch? Cruise Only instead! 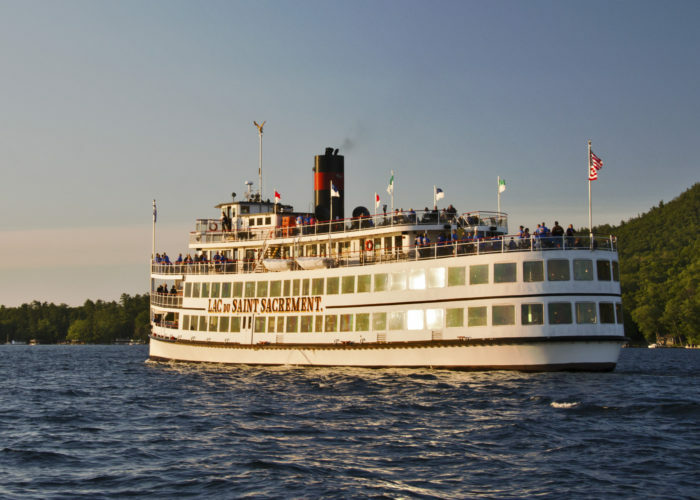 Experience the lake’s best views from the upper decks of our flagship Lac du Saint Sacrement. 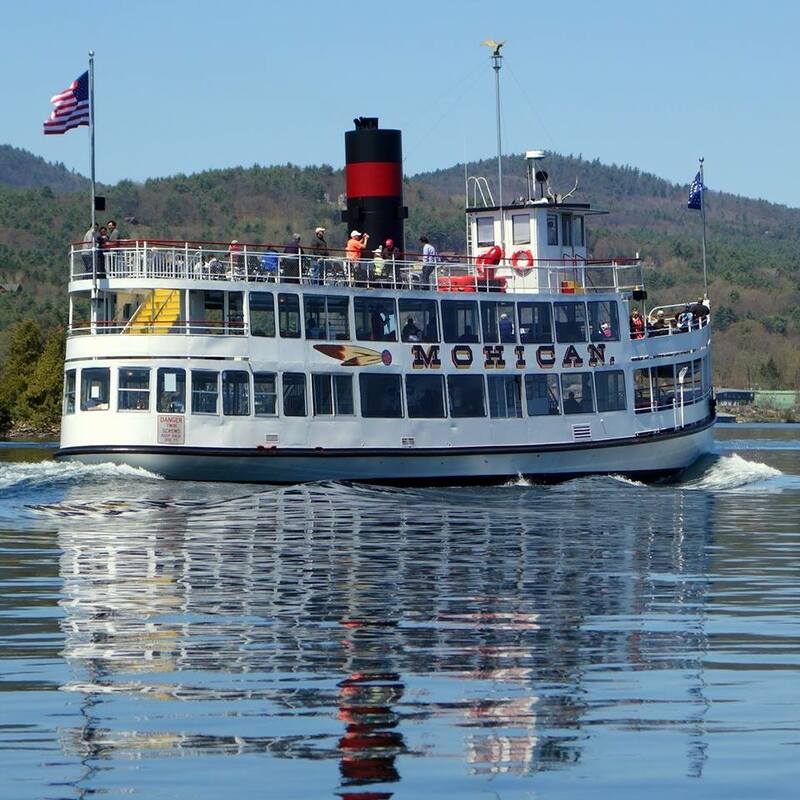 The Midday Sightseeing Cruise will take you north past the Lake George Club to Bolton Landing where you will see the stately Sagamore Hotel. See island campsites, islands with private homes and Dome Island, a wildlife refuge. As you head back, be sure to look for Speaker Heck Island, where Bald Eagles have nested for many years. Looking for a Noon – 2pm Sightseeing Cruise pre season or after September 29th? Not interested in Brunch? Cruise Only instead! Prepared fresh daily, our dinner buffet offers 3 hot entrees: Chicken, Fish or Vegetarian, a Carving Station, a large salad bar, assorted breads, rolls and cheeses, dessert and non alcoholic beverages. After dining, relax in your seat, enjoy the entertainment or head topside to enjoy the fresh air on the outer decks. 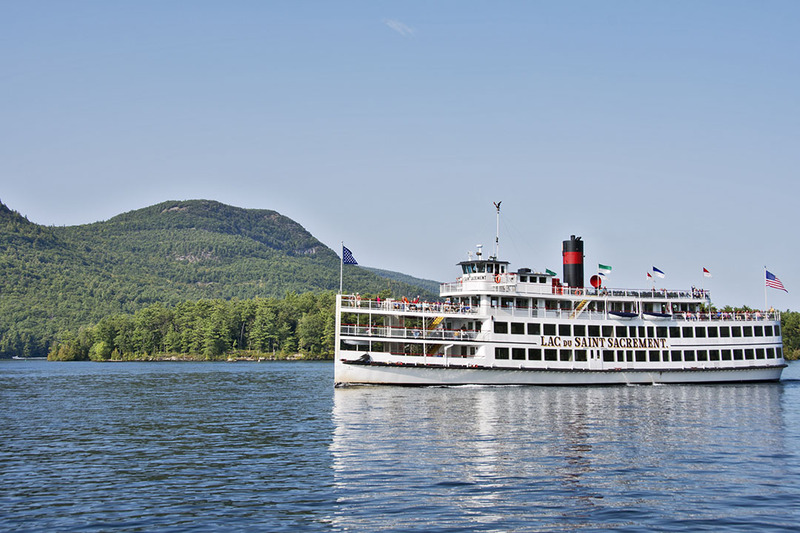 Cruise by beautiful mountain wilderness areas on the crystal clear waters of Lake George while enjoying the Adirondack Sunset. The Saint’s Dining Room is climate controlled for your comfort. Prime Rib is offered at the Carving Station on Sundays. Enjoy the addition of St Louis Ribs to the buffet on Mondays. Not interested in dinner? Cruise Only instead! Experience the lake’s best views from the upper decks of our flagship Lac du Saint Sacrement. 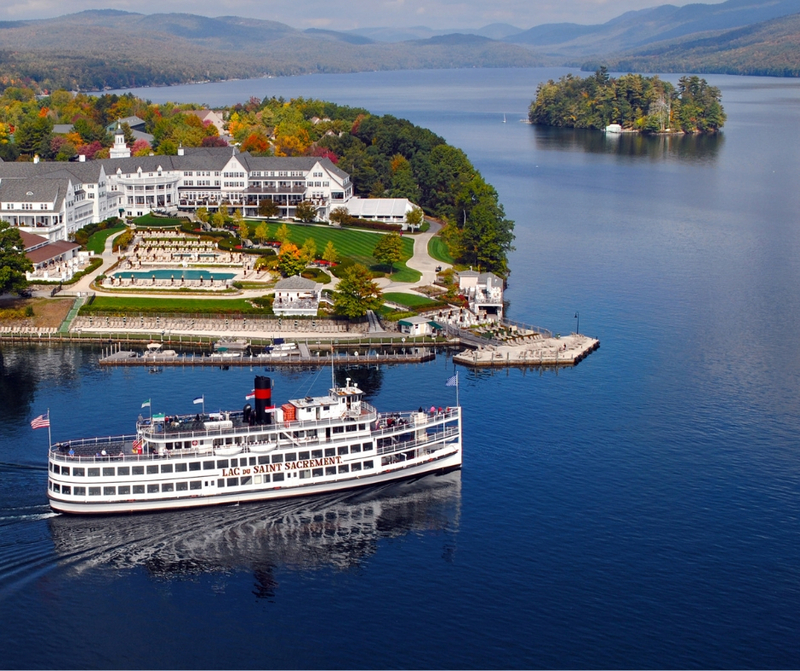 The Sunset Sightseeing Cruise will take you north past the Lake George Club to Bolton Landing where you will see the stately Sagamore Hotel. See island campsites, islands with private homes and Dome Island, a wildlife refuge. Enjoy a spectacular sunset as you turn around and head south to Lake George Village. On your way back, be sure to look for Speaker Heck Island, where Bald Eagles have nested for many years. Fall Dinner Cruises sail from 6-8PM. We have just a few this year. Please use the booking link below to check for dates. Interested in a Thursday Evening Dinner and Fireworks Combo?